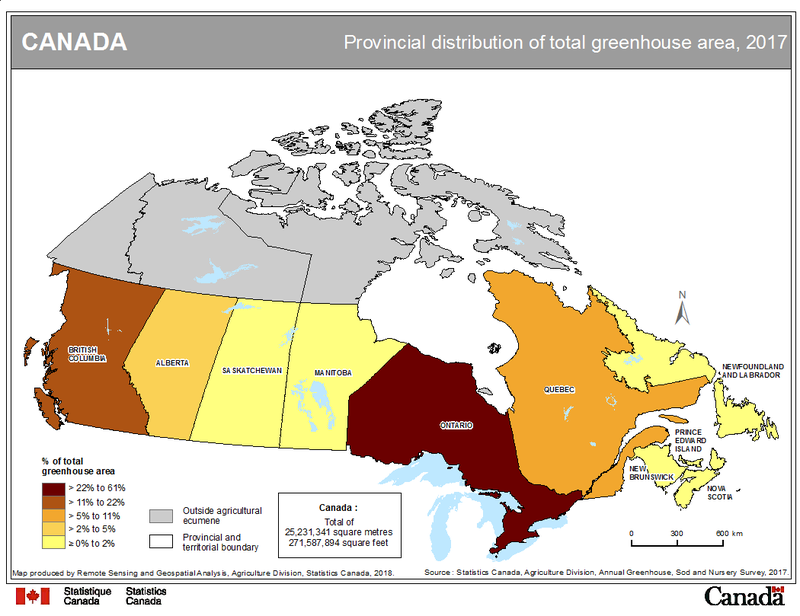 The title of the map is "Provincial distribution of total greenhouse area, 2017"
This map shows the provincial distribution of total greenhouse area, 2017. The total for Canada is 25,231,341 square metres or 271,587,894 square feet. A colour is assigned to a category. Each category represents an interval of the proportion's values. Provinces and territories are outlined in a thick black line. A North arrow is shown to orientate the map. A graphic scale has been provided to evaluate the size of the map. Statistics Canada, Agriculture Division, Annual Greenhouse, Sod and Nursery Survey, 2017. Map produced by Remote Sensing and Geospatial Analysis, Agriculture Division, Statistics Canada, 2018.